At last the tomatoes are coming onstream. So much for my naive belief that the greenhouse would bring this happy state of affairs forward on the calendar. Never mind, despite the setbacks and cultivation difficulties we're there now. All the varieties are producing, even the Noire de Crimée in its bed in the isolation ward. The odd seeds that I had casually labelled Black are in fact Black Prince, easy enough to see now they are grown with cross referencing to my records. Don't remember saving the seed though! 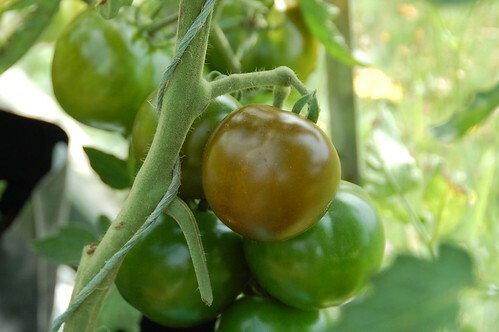 So far I've had fruit from Coeur de Boeuf, Longkeeping, Beefsteak and Black Prince in the greenhouse and the Latah outside has produced a handful of small tomatoes, with some of the Salt Spring beginning to show colour. But although the harvest should be cause for rejoicing I have to say they haven't been as delicious as I had hoped. 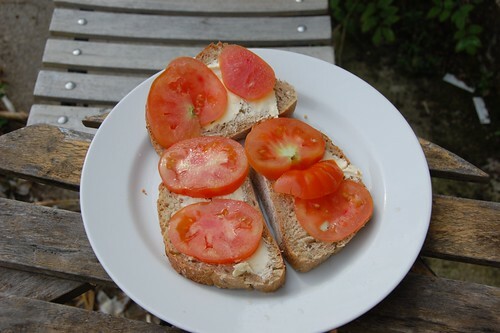 The larger tomatoes are rather tasteless and mushy with the Beefsteak indistinguishable from a Moneymaker (why is that I wonder, seed from HSL). The Longkeeping isn't fine flavoured, although to be honest that's not why I was growing it but more hopefully for an ability to extend the season. Instead it seems to be early, prolific and largely pointless as I'm pretty sure it will have finished long before the autumn. Of those I've tried only the Prince and Latah are providing anything like a fruit I'm eager for more of. In terms of easy cultivation and quality yield it looks like the Black Prince is the winner by a mile, the plants are strong with good setting and the fruit is pleasingly tidy on the vines. I also have high hopes of the Gezahnte Bührer-Keel, a Swiss-Italian heritage variety, which are doing much better under glass than they did outside last year (picture at the top). I just wish I could remember the name, I've resorted to calling them GBK in my head but still have to look it up every time I blog about them. Of course, some of the problems may be down to my growing techniques. There are plenty of rules of tomato growing available for anyone who wants to google them, everything from full regular (over)feeding to starvation and all sorts of management from stripping off every leaf to allowing every shoot to do its thing. Mostly I've favoured minimal input and limited training, the last mainly because I detest the yellow stain and smell of the tomato dust. On a hot day it leads to migraine and nausea so I avoid touching the plants at all if I can. This year because I've overfilled the space available I'm having to take a bit more of an interest in keeping the plants tidy if only to remove the places that slugs can hide and allow the sun to see the fruits, but I'm wondering if this combined with skimpy feeding has produced its own problems. I'm not convinced it's all down to culture because the Black Prince is working for me so perhaps it's just my choice of varieties this year. With a feel for the way the greenhouse works again (it must be six or seven years since I made any effort at glasshouse toms) I'll be more confident with starting seed and choosing varieties for next year. 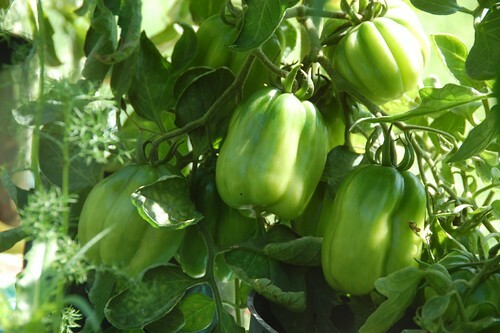 I've enjoyed Potiron Ecarlate in the past, a magnificently large tomato with great flavour and Purple Calabash is another heritage sort that has good flavour. There are so many good fruit to choose from, has anyone any favourites they think I should try? The GBK look very interesting. I'll also be keen to hear how the Longkeeping does; I've been thinking of trying to track down some of the varieties intended for storage. Strangely, my greenhouse plants are no earlier than those grown outdoors, but then it was a warm Spring. I like Green Zebra and Black Russian. I don't get around to taking off side shoots regularly, but I think that I would get better results if I did. Ian, I'll keep you posted about the Longkeeping but probably not much good if you start them at the same time as the maincrops, since they seem to be earlier maturing than most. Z, the Green Zebra look interesting but I seem to have discovered a hitherto unknown prejudice in myself against green tomatoes, it seems so wrong. I think I did try Evergreen one year and it was a flop so perhaps that's why.